It takes so little of your time, yet goes a long way in preserving what is left of our freedoms. For over 20 years we have warned that Agenda 21 is not about environmental protection or even good-sense conservation. Instead, we used its supporters' words describing it as a "comprehensive blueprint for the reorganization of human society." We have also warned that the threat of global warming is simply a tactic to scare people into fear of "environmental Armageddon" in order to enforce acceptance of the Agenda for the 21st Century - in order to reorganize human society. Of course, as we began to succeed in getting that message out, the mantra changed to: "Agenda 21 is just an innocuous 20-year-old document that is merely a suggestion and has no enforcement power." They attacked us with words such as "delusional conspiracy theorists who see black helicopters." Item: UN climate-change czar Christina Figueres, in a recent interview in BusinessGreen, said, "I think it is very important to understand that we will only pursue climate goals through the national pursuit of the SDG." She means the 17 Agenda 2030 Sustainable Development Goals. She has therefore confirmed our contention that the global-warming issue exists specifically to drive the acceptance of sustainable development and Agenda 21. Just as we warned. Item: In that same interview, Figueres made it clear that the use of Public Private Partnerships is the tool of choice to move the agenda forward and that the Agenda 2030 goals serve that purpose by helping to make the "transition" profitable for those corporations that play ball. "It's clear that businesses are already taking on their responsibility because they do see it as an opportunity." Item: Communist China has fully adopted Agenda 2030, incorporating the scheme in its latest five-year plan. China will host the G20 Summit to enlist "inclusive and coordinated development" as one of the four key topics for discussion for implementing the 2030 Agenda. Item: As in any totalitarian movement, it is essential to silence opposition. It has been almost breathtaking to witness the lengths the sustainabilists will go to achieve that end against climate skeptics. In March, 17 state attorneys general (AGs) (16 Democrats and one Independent, representing California, Connecticut, District of Columbia, Illinois, Iowa, Maine, Maryland, Massachusetts, Minnesota, New Mexico, New York, Oregon, Rhode Island, Virginia, Vermont, Washington State, and the U.S. Virgin Islands) organized under the banner of "AGs United for Clean Power." They began a legal action to pursue climate-change dissenters, starting with ExxonMobil Corporation and the Competitive Enterprise Institute. Seventeen Republicans on the House Science, Space and Technology Committee have issued a request for the attorneys general to turn over documents related to their campaign to the House Panel to detail their reasons. The AGs have refused to cooperate, citing "states' rights" under the 10th Amendment! Please phone and email your state's attorney general and demand that he or she protect the freedom of speech of so-called "climate change dissenters" by not participating in the "AGs United for Clean Power" movement. 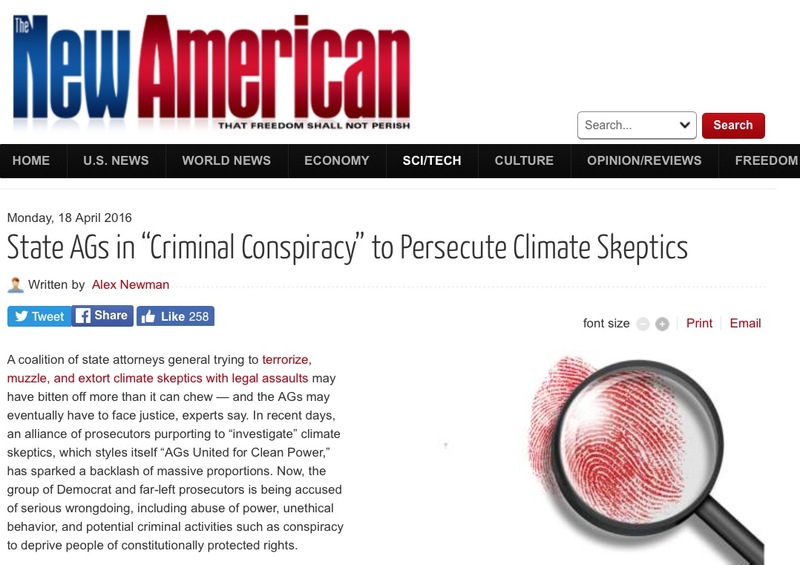 Urge them to read "State AGs in 'Criminal Conspiracy' to Persecute Climate Skeptics" at TheNewAmerican.com for the details on what's wrong with the "AGs United for Clean Power" initiative. Click here for a way to look up phone numbers for your elected officials (including your attorney general). Click here to send a prewritten, editable email to your attorney general. Copies of your email message will be sent to your representative and senators in Congress and your representative and senator in your state's legislature.